The Vibra Fit Original is the first model in Vibra Fit line of professional exercise machines. The Vibra Fit uses state-of-the-art vibration technology to give you a great workout at home. 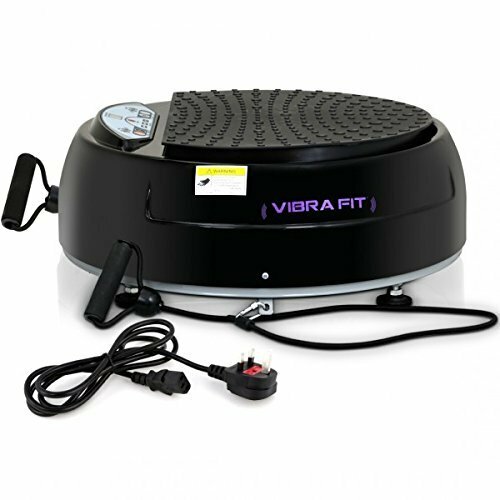 The vibration plate works similar to a see-saw, oscillating on both the right and left sides. This motion helps your muscles contract and retract at a faster rate to boost your metabolism, increase blood flow and will help you to lose weight. When you're on the Vibra Fit, your body continually re-balances itself, giving you a full body workout in just a few minutes. To get started, set-up your Vibra Fit by plugging it in and use the remote control to set the time and speed of machine. Programmed with three pre-set levels and 20 speed settings, it allows you to exercise at a pace that's right for you. You can simply stand on the machine or do your favorite exercise positions such as squats, lunges, push-ups and planks. For a more intense and fun workout, try adding the resistance bands to your routine. What comes in the box? • Vibra Fit (VF-5300) • (2) Resistance Bands • Remote Control • Power cord • User Manual Product details: This product is available in black Voltage: 110V~ 130V Frequency: 60Hz Input power: 200W Uses (2) AAA batteries (not included) Weight approximately: 20.5kg (unit only) Size: 55 cm diameter; 22 cm height Some assembly required WARNING: You should always warm up before using the Vibra Fit. See our Videos for a free warm up workout. Do not use the machine on a full stomach, and drink plenty of water before and after using the Vibra Fit. Do not use the Vibra Fit for more than 10 minutes at a time. The Vibra Fit should not be used by children under 14 years of age, or by women that are pregnant. If you suffer from any abnormal medical conditions, or are starting a new exercise regiment, you should always consult your doctor before you begin using any Vibra Fit products.